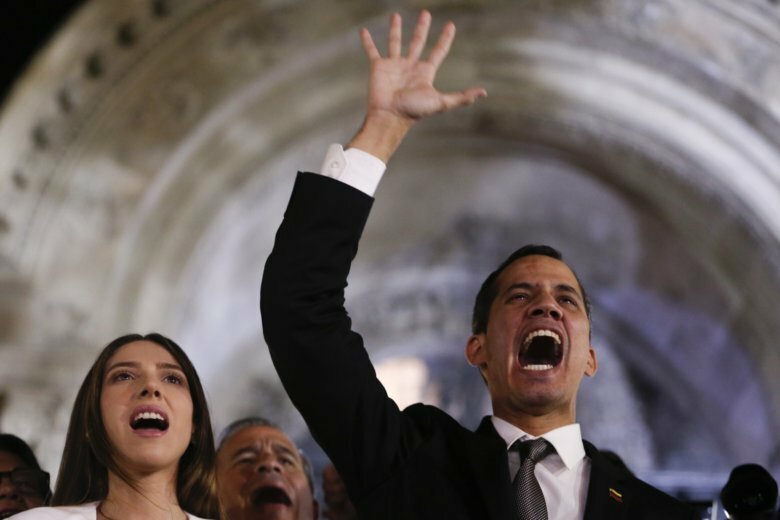 CARACAS, Venezuela (AP) — Opposition leader Juan Guaido urged supporters to stage huge demonstrations Monday coinciding with his planned return to Venezuela, in a challenge expected to escalate his power struggle with President Nicolas Maduro. “See you tomorrow,” Guaido said in a live video address on social media Sunday night. He delivered a defiant warning to Venezuelan authorities, saying any attempt to detain him “would be without doubt one of the last mistakes” that the government commits. Guaido spoke to the camera in a room with his wife, Fabiana Rosales, beside him and a Venezuelan flag in the background. Guaido, the leader of the opposition-controlled National Assembly who has declared himself interim president, did not say where he was and he did not reveal any details about how he planned to return to Venezuela. Earlier Sunday, Guaido tweeted a photo of himself walking across an airfield ahead of his departure from the naval base in Salinas, Ecuador, where he met with Ecuadorian President Lenin Moreno on Saturday. Guaido said he was “taking off,” but did not say where the plane was heading. In Venezuela, anticipation grew ahead of the expected arrival of Guaido, who says Maduro must be replaced by a transitional government that lays the groundwork for free and fair elections in a country suffering shortages of food and medicine. Opposition activists circulated a call on social media for people to gather Monday morning at the Alfredo Sadel plaza in Las Mercedes, a shopping and entertainment area in Caracas where protests have been held in the past. Protests were planned at other locations around the country. The government, meanwhile, urged Venezuelans to celebrate the Carnival season slated for Monday and Tuesday by traveling to beaches and other holiday spots. Many people don’t have the resources for leisure trips and opposition supporters say the country should not celebrate during its political and humanitarian crisis. Rodriguez spoke during a visit to Russia, which backs Maduro and has accused the United States of plotting his downfall. Guaido was in Ecuador as part of a tour of Latin American countries designed to increase pressure on Maduro to resign. Maduro says Guaido is part of a U.S.-backed plot against him and that a failed attempt by the opposition to bring aid into Venezuela from Brazil and Colombia last weekend was a political stunt. The United States and about 50 other countries recognize Guaido as Venezuela’s president, arguing that Maduro’s re-election last year was a sham. EU foreign policy chief Federica Mogherini has warned against any action by the Venezuelan government against him. “In this respect any measure that could put at risk Juan Guaido’s freedom, safety or personal integrity would represent a major escalation of tensions and meet the firm condemnation of the international community,” Mogherini said.